This utility quickly splits large MBOX message database files into separate message files in EML format. After that, you can work with them directly in Windows Explorer, do a search, send to other users, and import into Outlook and other email clients.Virtually nothing can be done with message databases in MBOX format. This format is not supported directly in Outlook and other mail clients. All messages in MBOX format are in a single file, separate for each folder. File size can be very large – up to tens of gigabytes. Working with such large files causes great inconvenience. Messages in various MBOX formats (mboxo, mboxrd, mboxcl, mboxcl2 and others) were supported earlier by many mailers, but this format is rare and outdated. One of the easiest ways to transfer old messages to new email programs is to convert to EML format and import.This utility can convert multiple MBOX files at once. Here, a new folder will be created for each file. If MBOX files reside in nested folders, a similar folder structure can be created for resulting EML message files.To migrate many mailboxes in different folders for different users, the product provides the command line. 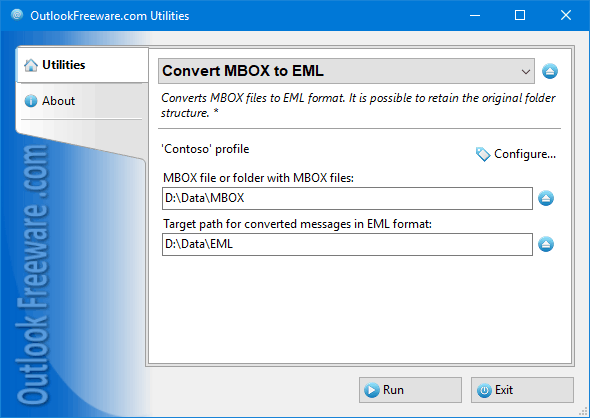 Using batch files, you can configure any variants to convert MBOX to EML.